YAMAHA DM2000 VCMThe new DM200 VCM Yamaha console is an enhanced version of the original DM2000 V2 with a range of processing additions including analogue open-reel tape decks simulation, classic compression and equalization recreation, a complete suite of REV-X reverb effects, a surround post-production package and a selection of vintage stomp boxes. 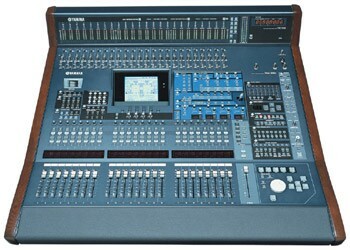 The console has superb sonic performance with a full 96 channels of 24-bit/96kHz audio and 32-bit internal effects. The surround processing features include panning and monitoring with a joystick, the ability to handle multiple 5.1 stem mixes and down-mix matrix, ideal for DVD production. The desk integrates very well with the leading DAWs including Logic Pro 7 and Pro Tools to create a controllable and fully automated production and mixing environment. The Studio Manager software for Mac and PC allows total control of all parameters with the classic Yamaha interface. If you are serious about your home digital environment, in need of 96 channels and looking for some hands-on control of your parameters whilst working with top-end sequencers and production software then you should consider the Yamaha DM200 VCM. Simplicity and versatility is key for this digital console from Yamaha.